Vancouver, May 2017 – W2R has now become W2RBC.ca. That’s because there is now a new W2R chapter starting in Ontario (which may become known as W2RON.ca). Bill Humphries and his assistant Joanna Banaga attended a W2R retreat at UBC recently and explained how his chapter is just beginning. His group is “trying to improve the indigenous presence in libraries wherever they can” through finding dedicated space, putting in shelving and books courtesy of Jeff Burnham of Good Minds Books in Toronto. Jeff Burnham of Good Minds Books in Ontario attended the retreat via video conferencing. 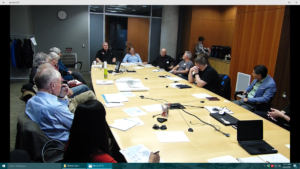 Thanks to fibre optic wiring, attendees of future meetings can see and hear each other via cameras and wiring. W2R hopes to install Learning Centres with fibre optic wiring, which would allow for video conferencing between W2R members and First Nations leaders in remote locations. Fibre optics would also allow for Long Distance Learning, which would allow First Nations students to visually attend classes in colleges located in urban centres. This would mean the best and brightest students would not have to leave their communities in order to access vocational training or college-level classes and professional mentoring. Bob Blacker illustrates how the conferencing technology actually works. Jeff Burnham in Ontario explains what he is doing to make W2R libraries “sustainable.” Operation and maintenance of libraries are a cost and a prime concern. Jeff explains that the Department of indigenous Affairs “needs to get its head out of the sand” and fund libraries. Jeff Burnham in Ontario joined the W2R retreat to talk about the need for some people to step forward with fundraising. 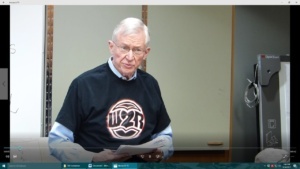 Bill Humphries models the new W2R t-shirts that will be made available for sale on the new Store section of the new W2RBC website. 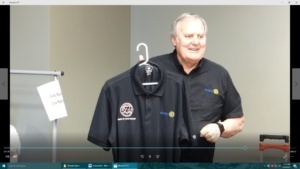 Team leader Bob Blacker shows off 2 new shirt designs that will have both the W2R and Rotary logos.